The Trust was delighted to be presented with a cheque last month by a group of entertainers from Stogumer, North Somerset. 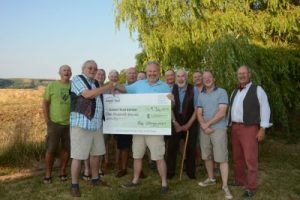 Derek Illman and other members of The Stoggymen kindly presented the cheque for £1,000 to Jeremy Duxbury, Head of Fundraising at Calvert Trust Exmoor, in early July. The group from Stogumber have become well known locally for providing entertaining evenings and raising funds for various charities. They sing a variety of songs including humorous country, folk, sea shanties, and traditional songs, interspersed with the occasional monologue or funny tale. We’d like to thank the group for their kind donation, and wish them all the best with their future performances and continued fundraising activities.